Like a phoenix, Dresden’s magnificent Frauenkirche, a masterpiece of baroque architecture, has risen from the ashes, its amazing 10-year reconstruction the result of “the most successful initiative of ordinary citizens” in German history. When the ornate gold cross, donated by Britain’s Dresden Trust, is set atop the pinnacle of the dome on June 22, 2004, it will mark 10 years of reconstruction, the most extensive rebuilding effort in German history. Aaron Smith, the British goldsmith who created the new pinnacle cross, exactly like the original, is the son of one of the British Lancaster pilots who bombed Dresden in 1945. The sandstone Frauenkirche, originally designed and built in 1726-1743 by State Master Builder and Architect Georg Bähr, was considered, before its destruction, to be the most significant church building of German Protestantism and one the great masterpieces of European architecture. The rebuilding of the church’s interior with its famous Gottfried Silbermann organ from 1736 will be finished for the church’s re-opening on October 30, 2005, in time for Dresden’s 800th anniversary in 2006. 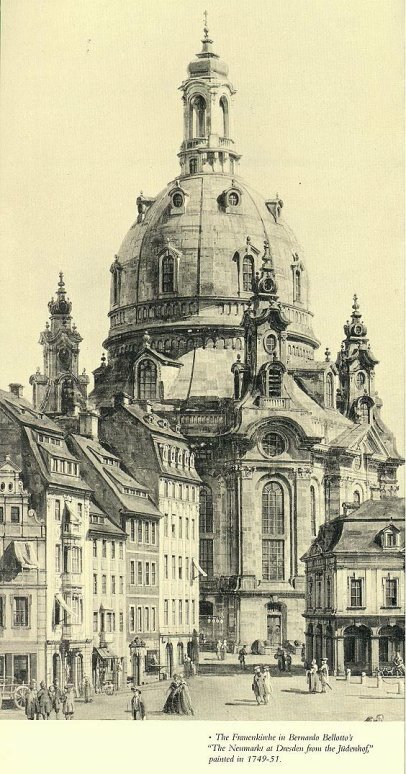 The initiative to rebuild the Frauenkirche began with a group of 14 citizens led by Dresden musician Ludwig Güttler in 1990. Today the society funding the rebuilding has more than 6,400 members in Germany and 20 other nations. In the United States the rebuilding effort is supported by Friends of Dresden, Inc., headed by the Nobel laureate Dr. Günter Blobel who donated the $1 million he received when he won the Nobel Prize for Medicine in 1999. The reconstruction, when completed, will have cost some $170 million, most of which was raised through individual donations. Some $12 million is still needed. While the rebuilding of Dresden’s Frauenkirche has a special significance, there are a number of architectural masterpieces in the Saxon capital, formerly known as “Florence on the Elbe,” which have been completely restored since 1945. Among these are the Semper opera house, the Zwinger galleries, and the Catholic cathedral. As the people of Dresden remembered the destruction of their city and the loss of life on Feb. 13-14, 1945, a controversial book about the Anglo-American firebombing attacks appeared in British and American bookstores. As the people of Dresden commemorated the attacks with performances of Mozart’s Requiem in the Semper opera house, Taylor’s book created a scandal with its thesis that the incendiary “area bombing” and destruction of Dresden was “completely justified and useful,” Bild reported. However, neither the huge military base across the river nor the industrial areas around the town were targeted. Asked why the city center had been attacked, Taylor said, “That was how the British did city attacks then.” Communication centers, meaning the railroad stations, were the primary targets of the raids, he said. Taylor said he had come to the same conclusion as Götz Bergander, author of Dresden im Luftkrieg in 1994. Bergander’s work has not been translated into English. There were 8 Allied bombing raids against Dresden between Oct. 7, 1944 and April 17, 1945. While U.S. bombers attacked Dresden six times, it was the two British night attacks of Feb. 13-14 that were the most devastating. The British Lancaster bombers dropped one 8,000-pound explosive device and 529 4,000-pound bombs while releasing 1,181 tons of incendiary bombs during the Ash Wednesday attacks. The British tactic of “area bombing” caused huge firestorms that incinerated complete city centers. “The fire-bombing of the city of Dresden in February 1945 became probably the most controversial operation carried out by British and American forces during the Second World War,” Roger Hutchinson of The Scotsman wrote. “A fire storm engulfed the old center of Dresden. It was deliberately created to leave no human life in its wake. Men looked from above, aghast at what they had wrought. Men, women and children down below were boiled alive in the supposed sanctuary of fountains and reservoirs,” Hutchinson wrote. The painstaking rebuilding of Dresden’s magnificent opera house, art galleries, and churches is a remarkable achievement, and the buildings’ scorched stones serve as silent reminders of the holocaust that destroyed the historic old city and untold thousands of innocent victims in a matter of hours. On April 17, 1945, 580 U.S. B-17 bombers dropped 1,555 tons of bombs and 165 tons of incendiary devices on Dresden. Taylor said some of the U.S. bombs were dropped on Prague by mistake. The number of deaths caused by the firebombing remains controversial. The official figure is based only on the number of corpses that could be identified: 35,000. However, with thousands of refugees passing through Dresden and the huge piles of corpses that were cremated in the market square, some historians estimate that more than 200,000 died in the bombing of Dresden. Art Shay, who flew combat tours over Germany in 1944-45, reviewed Taylor’s book for the Chicago Sun-Times. Taylor’s “masterpiece of scholarship,” Shay wrote, “gives the lie to much of Slaughterhouse-Five.” Slaughterhouse-Five is the title of a 1969 novel by American author Kurt Vonnegut. While Slaughterhouse-Five is synonymous with the destruction of Dresden for many Americans, in Dresden the connection between the old slaughterhouse and American literature is virtually unknown. As an American prisoner-of-war, Vonnegut knew his camp as “Slaughterhouse-Five,” which is actually the post address of the slaughterhouse’s administration building. Vonnegut survived the bombing in a cellar and saw the destruction of Dresden first-hand as he participated in the recovery and cremation of the corpses. Five years ago, Vonnegut returned to Dresden and visited the slaughterhouse where he had been held as a P.O.W. A small three-star hotel called Wenotel, built in 1982, stands on part of the slaughterhouse grounds today. The walled complex, built by Dresden’s architect Hans Erlwein in 1906-11, was Europe’s most modern livestock- and slaughterhouse of its era. Dresden is known for being the place where the first sewing machine was invented. The bra, the manufactured cigarette, tea bag, squeezable toothpaste, and the latex condom were all invented in Dresden. Slaughterhouse-Five on the Elbe River is about one mile from the city center and was only slightly damaged in the raids. While some of the buildings have been recently renovated to form part of a convention center, much of the slaughterhouse complex remains as it was when Vonnegut and other prisoners-of-war were held here. It was a working slaughterhouse until 1995.